Metabolomics is an analytical toolbox to describe (all) low-molecular-weight compounds in a biological system, as cells, tissues, urine, and feces, as well as in serum and plasma. To analyze such complex biological samples, high requirements on the analytical technique are needed due to the high variation in compound physico-chemistry (cholesterol derivatives, amino acids, fatty acids as SCFA, MCFA, or LCFA, or pathway-related metabolites belonging to each individual organism) and concentration dynamic range. All main separation techniques (LC-MS, GC-MS) are applied in routine to metabolomics hyphenated or not to mass spectrometry, and capillary electrophoresis is a powerful high-resolving technique but still underused in this field of complex samples. Metabolomics can be performed in the non-targeted way to gain an overview on metabolite profiles in biological samples. Targeted metabolomics is applied to analyze quantitatively pre-selected metabolites. 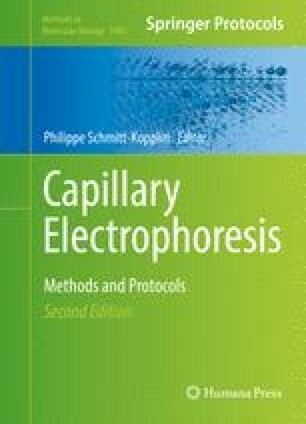 This chapter reviews the use of capillary electrophoresis in the field of metabolomics and exemplifies solutions in metabolite profiling and analysis in urine and plasma.